Christmas is the best time of the year! No doubt about that especially when it comes to decoration. Since we moved to our new house this year, I have a whole new place to decor for the Holidays and I can’t wait to start! We are only going back home in a few weeks but until then I’m just browsing and collecting ideas. So I thought why not come up with a series of posts with different decorating styles for the Holidays. So here’s the first one: The Classic Red. Every year I try think about something different or at least rotate the decoration themes. We had a brown and silver style last year, so my choice is red for this year. Honestly, you can never go wrong with this colour. It’s so obvious. Red might be the first thing that comes up when you hear the word Christmas, right? Well it is for me. I love to have a neutral colour scheme for my interior because it’s so easy to add any kind of accessories. Not to mention it’s the easiest way to change the style if you’re fed up with, because you only need to update them not the furnitures or wall paints for example. I can’t think of anybody around me having a red couch but I just love this one. If you’re about to change yours, go for it. This pop of colour lightens the whole room up. All you need is a few Christmas themed pillows and a nice soft throw, a center piece on your coffee table and you’re done already. Decorating the staircase with garlands is obvious. 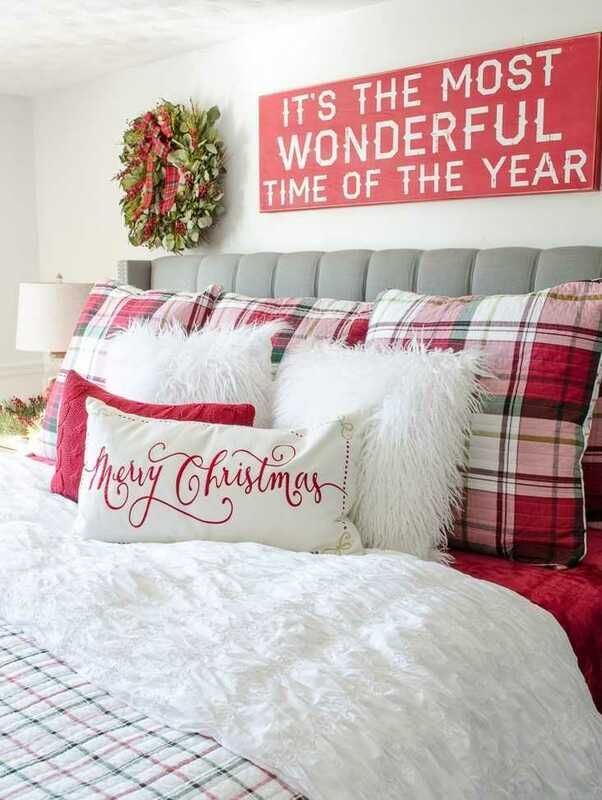 Changing your everyday wall hangings to Holiday pieces is a great idea too. 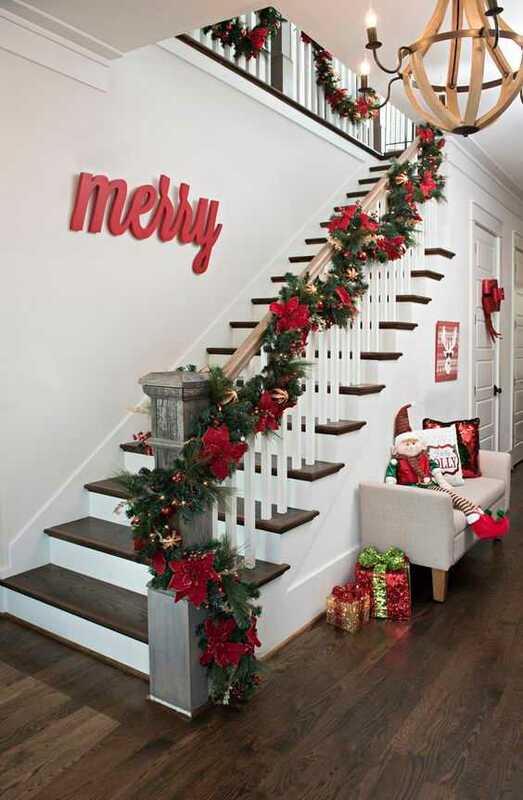 I also adore this Merry sign above the stairs. Notice the big red ribbon on the door? What a great idea. You can also DIY it with your little ones one afternoon. Here’s an easy tutorial on how to make it. 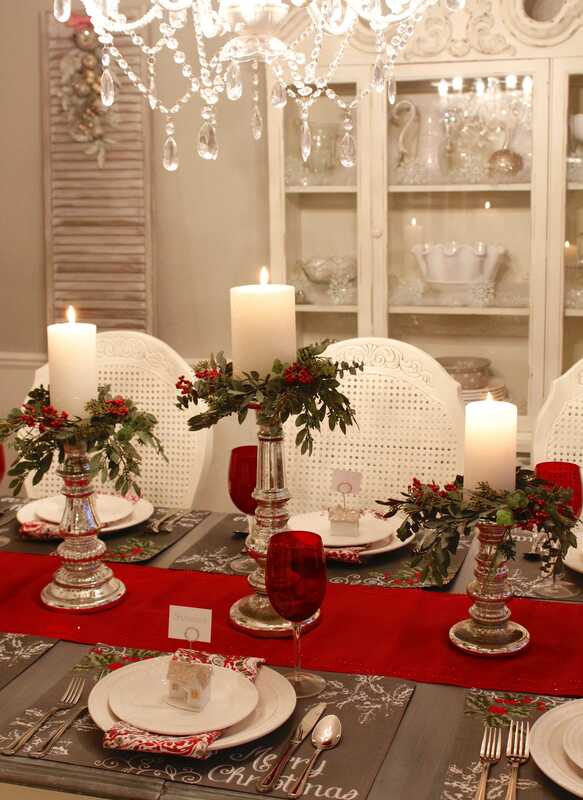 Setting up a Christmas table is just as important as decorating the house inside and outside. I love when my decorations flow through the whole house using the same colour scheme everywhere. I think those tiny little house shaped place card holders are the cutest. As I look through this picture investing in a set of red coloured wine glasses seems like such a good idea.. (hmm.. let me look up the internet for them right away). If you’re using a bright coloured table runner or place mats, it’s always a good idea to dress the setting down with simple white plates and silverware with matching candle holders so it doesn’t look too busy. I never thought of changing my bedding for the Holidays before, but I might just made up my mind. 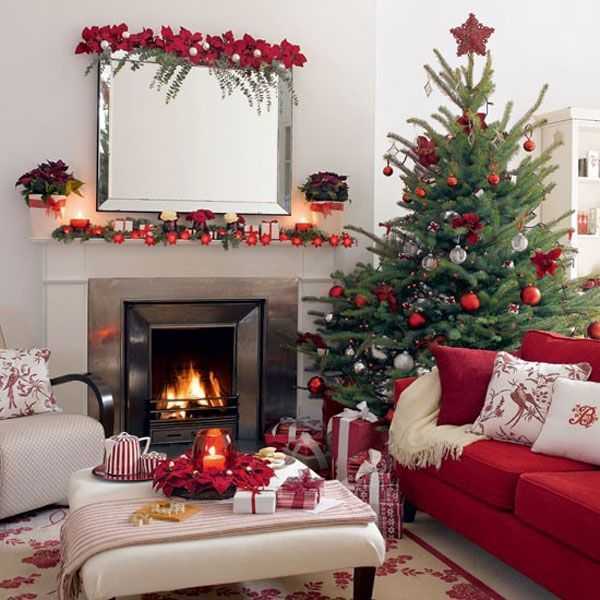 Why not feel that Christmas spirit everywhere in the house? Adding just a tiny bit of colour here and there is always better than going crazy or getting overwhelmed. Sneaking in soft, fuzzy items makes your decoration feel more homey and encourages you to make yourself comfortable, relax and sip a cup of hot cocoa with your loved ones. I collected the best RED Holiday decoration pieces out there so have a look around and start shopping. I hope you’re having fun decorating your homes this year. Hands up, who’s choosing red just like me?